Coral is a type of aquatic rocklike structure, formed from the bones of tiny sac-animals, that comes in many different varieties. In Sload society, it is prominently used in their architecture, with the Coral Tower being made from blood-red coral before its collapse. 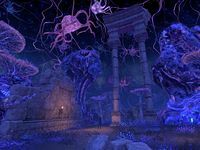 Some of the most ancient ruins of Summerset Isle are thought to have been built by the Sload and are made of coral, including the original architecture of Cloudrest. In Morrowind there is a naturally-occurring bioluminescent, and possibly sentient, coral species that grows on the lands around the Inner Sea. Coral ghosts are supposedly horrifying to behold and are said to resemble old cheese. Antler Coral (also known as Ocean Antler Coral) is a type of underwater coral, not to be confused with the rarer terrestrial Land Coral. The Coral Tower of Coldharbour appears to have been partly reconstructed from Antler Coral which was transported to the realm from Thras. Coral reefs are submerged in water, growing at the bottom of the ocean. There are coral reefs located in the Inner Sea and off the south coast of Stros M'Kai. 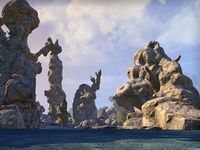 Summerset coral is petrified and found close to bodies of water. It can be bioluminescent. Land Coral (sometimes Land-Coral) is a bizarre, bioluminescent, and possibly sentient coral variety that grows on land. They can only very rarely be found along the Inner Sea of both mainland Morrowind and Vvardenfell. They only come shaped as Antler Coral and the tips of the coral give off a natural fire-like bioluminescent glow. Land Coral can come in a variety of sizes and has the potential to grow large enough to tower above the landscape. It can be used to make snorkels, an apparatus for breathing underwater. A mysterious coral believed to be an import from the Thrassian archipelago, it is often seen in Sea Sload mindscapes. It appears very similar to petrified Summerset coral, but has a more lively purple tint. In the Spiral Skein of Mephala, coral comes in at least two known types. The Brittle-Vein coral thrives on the remains of people who fell victim to the spiders from the realm, and the Spiral Skein Elkhorn coral gives off a welcoming bioluminescence that the spiders use to lure victims into their webs. The Ceporah Tower may be constructed from coral. Coral Crabs are a type of sandcrab with coral growing on their shells.